Sometimes we set impossible goals, or goals we’re not quite ready for, and then we beat ourselves up for not accomplishing them. It’s good to have a schedule or a plan and to stick with it, but if it’s totally overwhelming it’s going to be counter-productive. If you discard a goal and feel bad about it, know that today is a new day. How can you modify the goal and feel more at ease? Life is not a race and what others accomplish has nothing to do with you. I made a goal at the beginning of 2016 to offer something free or paid art-wise to my artist friends. I followed through until June and when six months were almost up I realized so many things had been counter productive. I can just give up or beat myself up about it ad nauseam, but that is even more counter productive. I learned something along the way about the process and that is priceless. If I hadn’t taken the action I would still be in the dark. It’s not about discarding the dream, but to make it more streamlined to who YOU are, not what people might expect. Or even bigger still: what you expect of yourself. Listen to your own drumbeat. The beat of your own drum. 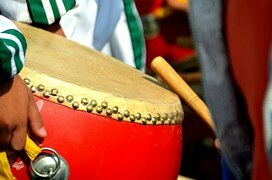 I have always been a doer and sometimes I forget to listen to my own drum. But it’s getting better. Nowadays, I don’t get as far away from myself as I used to do, and I truly want to offer the best me to the world. I don’t compromise while creating my art, but how I bring it out to the world the best way is still somewhat of a mystery. All I can do is keep exploring and see what responses I get. One thing I do know. Your dream is important and when you talk about it, you might help someone on the other side of the world as you pursue your own process. I often get comments like, “oh, I really needed to hear that today, thank you.” Then, what I thought was a half-assed blog post or art offering, means something. It’s verification that I’m headed in the right direction, and that I inspire others. That makes every step worth it. To find the right way sometimes takes many tries, but there are no failures, only experiences. Believe enough in yourself and keep the dream alive. There really is no other alternative! P.S. If you’d like to try one of my evergreen art journaling e-courses, go HERE to check them out. Stop if your heart is not on fire. When I do things I don’t like to do to earn money (and that is the only reason,) I feel like a vague shearing sensation in my chest. It occurred to me that’s what people do; they spend a lifetime doing stuff they don’t like and then end up with heart disease. What is the greatest killer today: heart disease. I don’t know the statistics on how many people hate their jobs, but I suspect it’s a hefty percentage. We created this mess. The kids are funneled like cows to slaughter through a school systems that does not work, to learn stuff they will never use. But stay in the fold for when you grow up, kiddo, you will or must have a job or you will be an outsider, and you will be poor. I suppose a boring job is not the only cause for heart disease, and doctor’s will tell you it’s the food you eat, but I believe it’s a lot more than that. It is based on deep misaligned emotion. When we force ourselves into a shoe that doesn’t fit, we feel uncomfortable. We know it’s wrong for us, but we force ourselves out of fear or out of lack of ideas for something better. School never encouraged you to think for yourself. The forced and unhappy behavior will create disease in the body. You’ve heard it before. People sometimes say that whatever disaster they went through was the best thing that ever happened to them, because it changed the course of their life. People who have had an awakening can’t go back to the old mindset. It’s like society in general hypnotizes us into a humdrum existence and it takes something drastic to shake us up enough to see that we act like sheep. We work like sheep and play like sheep. It gets very old. My point here: What gives you fire in the belly? There is no time to waste. Screw humdrum, screw fear. It’s time to wake up and do it! I have done a lot of passion inspired things in my life but right now I feel kind of “meh.” I’m hoping life is taking a new turn soon, because the sense of “been there done that” is overwhelming. I can’t wait to get excited again. I don’t like that shearing feeling in my chest when I force myself to do things I don’t like. Hello anxiety. What to do? Take stock of your emotions and pains in your body. When you think of your job do you feel excited or full of dread? If you have no clue what makes you fired up with excitement, do some excavating of dreams and desires, the ones you shoved under the carpet, maybe? It will take action to get out of the status quo, but everyone can do it with some effort. I know it’s possible. For more ideas, read Laura’s article HERE. P.S. for some free art how to videos, check out my YouTube channel HERE.